Ask fellow campers about "Melville Pond Campground" and nearby attractions. Our site was in the lower section and it was very nice. It was level with a picnic table and fire ring. The cable at our site was not watchable but we got TV over the air and we did get our satellite to work. We very much enjoyed our time here and would stay here again. We camped at Melville Pond Campground in a Motorhome. Traveling in a 38 foot coach we stayed 5 nights in a site for big rigs, site F13. The Good.... Big coaches need a gravel pad and we give this rv park 5-stars for the thick gravel pad. Each site has grass between and a nice brick pad with a fire pit. If you have a dog there is ample area to walk, plus a short walk down the lane is a great dog park. After 5 nights the dust on our coach was minimal compared to many other parks. The Bad.... Our site was not level (front tires were off the ground). If you desire privacy, request a site in the back of the park (sites are much roomier). Our satellite worked great at our site, however there are many trees in the back of the rv park so satellite reception would be questioned. On a side note: The office misled us in regard to their wifi. When we made our reservations we were told (both by phone and by email) that they have excellence wifi for checking email. Wrong! The entire time we were there only a couple times were we able to check our email (and that was after 11pm). Today we live in the age of wifi technology and there is nothing to stop this rv park from investing in doing wifi properly. For some users such as ourselves, wifi is an important feature and was one of the reasons for our stay here. We know enough not to count on a good signal over the weekends, but during the weekday there is no excuse. We even have the Wifi-Ranger on our roof with a direct-line-of-sight to their wifi source. There were no trees in the line-of-sight, and the distance wasn't a factor. If you're looking for a quiet and clean park where you can sit outside and relax... go here. We enjoyed our stay here, however because of their 'dishonesty' with the wifi strength we wouldn't return. We camped at Melville Pond Campground in a Motorhome. Campground has a nice appearance on entry, check in is easy. The roads are gravel and the sites are also gravel and dirt. The campground is tree shaded so satellite reception is not available for most sites. The cable is excellent. Our site, 107, was not the best, not level and mostly mud and dirt. Parking of the toad was very tight. Cell service is good. The campground is in a good location for visiting Newport, Portsmouth and Providence. We were there for just two days. We camped at Melville Pond Campground in a Motorhome. Very nice park. Well maintained. Gravel roads and gravel spaces. Fairly level. Many trees, no satellite service but camp has Direct TV and pretty good WiFi. Picnic tables and fire-rings at every space. All back in spaces, no pull thrus. Very friendly staff and very friendly campers. We stayed in space #107 - easy to back in - good open space, but many trees stopping satellite. We camped at Melville Pond Campground in a Motorhome. Campground is neat and clean, and seems to be well run. If I were to return I would stay in the lower older section that is very spacious. The newer pull through sites F 1-13 are way to close together. Though they are nice stone with paver patios and paver fire pits, there simply is not enough room for that number of sites that were built. When parked properly in my stone driveway, the fire pit for the site behind me ended up being approximately five feet from the back side of my rig as was my fire pit to my neighbor. I wonder if the owner would like to park their vehicle 5' from a fire pit. These sites are approximately 30' in total width when braking down camp I had to keep walking around fire pit, and was basically in neighbors site. My sewer connection was no more than 6" off of their patio. Felt much like rally camping with people I did not know. 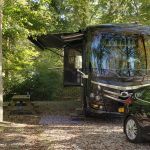 On a side note patios are at rear of sites and not positioned well for class A motorhomes, but not much can do with that, some have rear doors some have front doors. My price was lower than other stated because of Good Sam's plus a weekly discount. We camped at Melville Pond Campground in a Motorhome. Stayed here last year in site 200 and liked it very much. This year they put me in F10, their "premier" lot. Don't be fooled. It is a flat, gravel filled area that is very tight. My neighbor's sewer tube that goes into the ground is literally 2 feet away. So, that is what we have to look at when we make a fire. There are no trees. We are here for the Newport Folkfest so they demand a 4 day minimum. It was $80.00/weekday and $95.00/weekend, $350.00 way too much for camping in a parking lot. The man that checked us in was pleasant but that doesn't make up for this campsite. Wifi is good. We camped at Melville Pond Campground in a Travel Trailer. We stayed the week of July 4th. The location is perfect for sighting seeing the Newport area. Our sight was level and nicely shaded. The campgrounds are very well cared for and the park was quiet in the late evening. Once we're retired I look forward to staying for a whole month. We camped at Melville Pond Campground in a Travel Trailer. The cliff walk, mansion's, beach, kayaking lots of restaurants and wonderful seafood. We couldn't comment like others did regarding the owners, we never saw them. We made our reservation over the phone and paid the ridiculous $70. We checked in just before 7 p.m. and when we left around 10 the next morning, the "open" sign still wasn't on. Regarding the bathrooms: There were three co-ed bathroom/showers in one building. Stall #1 had no working light, stalls #2 & #3 had NO toilet paper. The next morning I watched a cleaning person leaning on the wall of stall #1 stall texting with her phone. The women's restroom building across from the showers wasn't any better. They were not clean and lacked paper. My husband said the men's room was the same. While it was a cute campground, it certainly wasn't worth the price. We also saw a sign that indicated there was a $10 fee to dump, but it didn't say if that was for non-campers or campers. Either way, we didn't dump. I would not recommend this place or ever stay there again. We camped at Melville Pond Campground in a Motorhome. Nothing much to do here...small playground if you have kids..We asked for pull thru..so we got Full sun and very close quarters. There is a pond. And a trail around it. Bout a mile long..dog park down the road. If you come here..ask for site down in the shade nice area. Sites are huge there with a lot of character... We camped at Melville Pond Campground in a Travel Trailer. This is an OK campground from which to explore the area. Newport is about 20 minutes away. The campground has gravel roads and gravel parking pads. There is a paver patio as well. Sites are level and a little close to each other but adequate for awnings etc. Cable is provided but we didn't use. Plenty of sky for satellite. Park is pretty open and is not gated. One complaint is they had a 3 night minimum and we only wanted to stay 2 nights. We camped at Melville Pond Campground in a Motorhome. Roads in the Newport area are extremely rough and narrow so take care with your navigation. We screwed up and found ourselves heading to the downtown area. Luckily a local was able to tell us how to get out but it wasn't fun. Dinner at the Mooring. Must try the scallop chowder! Also fun place to eat is Flo's Clam Shack. Quiet campground north of Newport. Away from downtown Newport but easy (15-20 minutes) drive into town. There are several parts of the campground...some open and some shaded. We stayed in a shady corner not too far from the tent campers. We had full hookups. Based on previous comments it looks as if the electrical has been upgraded as all hookup were on the correct side of the site. Use Google maps to find a shady spot in the summer. Or an open spot if you want satellite reception. Definitely would stay here again. We camped at Melville Pond Campground in a Travel Trailer. This is a very lovely campground, with a shady section of back-in sites with lots of trees and grass, and a sunny section with long pull-through sites. The pull-through sites are closer together than the back-in sites, but the pull-through sites are satellite friendly. We spent three nights in site F13, an end site that was very close to the Portsmouth dog park. We had a nice patio with a square, raised, concrete fire pit and a picnic table. The site was relatively level - we used only our front jacks. WiFi was well above average, but water pressure was below average. There are some nice hiking trails nearby, but if you have small dogs be aware there are coyotes in the area. We heard them howling late one night. The staff was friendly and helpful. Make sure to take Stringham off W Main, and then turn north on Sullivan Road to the park. The resurfacing of Sullivan is complete and it is smooth. I agree that it is a bit pricey for the amenities, but you are paying for the location - close to Newport. I would definitely stay there again. I wished we could have stayed longer. We camped at Melville Pond Campground in a Motorhome. Gulf Stream Bar & Grille is close by and very good. Anthony's Seafood is excellent. International Tennis Hall of Fame is awesome. We had a Good Sam discount, but it was very expensive for what you get in an RV campground. Monday through Thursday is $65, and Friday through Sunday is $75/night! We had 50 AMP electric, water, sewer, and cable. We did not use cable, but had many Over The Air Channels. The staff at Melville Ponds is very helpful and nice people. We were under the shade trees. The site was on a slant, so our 5th wheel tires on one side were off the ground to get level. It was a quiet RV campground. It is 5 miles north of Newport. There is a small laundry with 2 washers, and 2 dryers that was inexpensive. There is no pool or activity room, but they have a small playground for the kids. We did not use the restrooms or showers, so we cannot comment on them. It was the most convenient and close RV park to the Navy Base for our activities. It was just too expensive for what they provide, but I guess they can get away with it due to lack of competition. 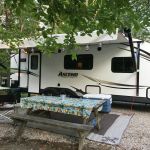 We camped at Melville Pond Campground in a Fifth Wheel. Everything in the area is very expensive, so bring your food and other items you need. Restaurants are very expensive for what you get in Newport, and not all that tasty. We were here for our Grandson's commissioning in the U.S. Navy, so we do not see a reason to return in the future. Great location, great spots, great staff, high price. Level spots, 50 amp, pull thru, patio, fire pit, good space. Great location for trips to Jamestown, Fall River & Newport. We really like this place, just wish the price was more inline with other campgrounds. Take the entrance off Main Street at the middle school. If you enter from anywhere else, you end up on a long dirt, washboard road. It will dust up and shake you up. We camped at Melville Pond Campground in a Motorhome. We entered the island from the north as we did not want to tow up thru Main Street thru town. We stayed one night in site #218, a back-in site with W/E/S. The roads aren't overly tight but the way they are laid out and where the trees are, this site is more of a pain to get into than it should be. The spot itself is fine. Note that despite what their website says, ALL of their sites have full hook ups. This isn't a fancy park, but clean and fine for passing through. Bathhouses, laundry, and grounds were all clean. Their internet was excellent. We had full LTE cell service (AT&T). The signage on the way in leaves you hanging, but we figured it out anyways. It brings you in along a long bumpy road. Google Map's directions, on the other hand, takes you by a school, but it brings you to the campground with only a little of the bumpy dirt road. This is what I'd recommend. We camped at Melville Pond Campground in a Travel Trailer. Go to Newport and take sailing trip! The #60 bus runs between Newport and Providence. It is on a 30 minute schedule, but since it splits East Main with West Main, service near the campground is hourly. Plentiful of PAID parking in Newport. Try the Cliff Walk. Had a good meal at the Brick Yard Pub on Thames Street. This is a boater's paradise. To visit the homes get the the dual membership at $75 from the newport preservation society and visit all the homes whenever you want. We spent 2 days visiting the homes. Parking was convenient at all of the homes. Do not try and visit with your travel trailer or RV, leave that at the campground. Are you affiliated with Melville Pond Campground ?